"Little help--I've gotten nothing but hot water for 4 years now &, the palace umbrella holders are getting weary." On the day after the election, the President was singing in the shower, "I'm gonna wash that man right out of my hair. I'm gonna wash that man right out of my hair. And send him on his way." 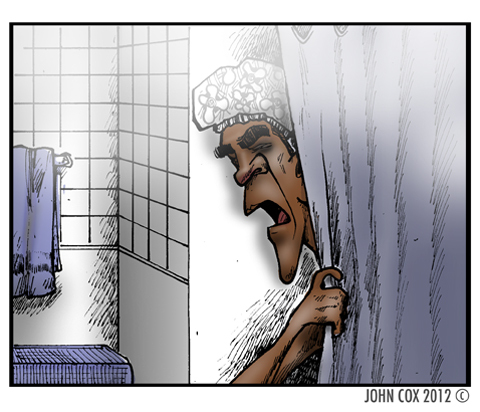 The president gets his briefings while taking a shower. "I've tried everything and I still can't wash off the stink from my campaign"
"Hey! I've got mud in my eye!" "Hey! Will somebody get this NBC reporter out of here?!" More soap! I can't seem to get this Benghazi blood off my hands! Sharp and a bit of a surprise. Kudos. Won't wash away your tears..."
All I can think of is the bath scene in Coming to America. "The royal _____ is clean." Crazy Joe says I'm articulate and clean - gotta act the part. Get Biden in here. My toe fungus is back and needs scraping. This page contains a single entry from the blog posted on November 15, 2012 12:06 AM. The previous post in this blog was Forward!.